Great advice from an adrenaline devotee, for those in the search of wild adventures while visiting the Mexican Mayan Riviera you cannot fail to visit Xplor eco-park. With an investment of 20 million dollars and after five years of work, in 2009 the Yucatan Peninsula welcomed Xplor, an eco-tourism park, offering six miles of adventure in the Mayan Riviera. Xplor eco-park is an exceptionally active and intense experience that you will never forget. The park‘s nature is unique, being partially underground it presents panoramic views that will awake your senses. Xplor offers four diverse activities that will take you through an extraordinary journey starting at the earth’s interior, an underground paradise surrounded by marvelous stalactites and stalagmites all the way to soaring through the sky above the vast rain forest. The activities may take from 45 minutes to 3 hours, according to your resistance. Eleven thrilling zip-lines through water falls and over the exuberant rain forest, the amphibious, amazing all-terrain vehicles along miles of jungle and underground trails, a unique underground raft route across caverns and stunning grottos over crystal-clear waters you will cross paddling with your own hands and the chilly stalagmite river where you will swim surrounded by the most incredible underground scenario ever imagined. One of the finest features of Xplor eco-park is the light and nutritious buffet prepared from healthy, nourishing foods and ingredients with the main purpose of recharging your energy. Around Xplor you will also come across stations providing energetic natural drinks, tea, coffee and oatmeal cookies. Every service and activity within the park is integrated in their single all-inclusive plan, incredibly favorable given that you can enjoy everything without any worries. 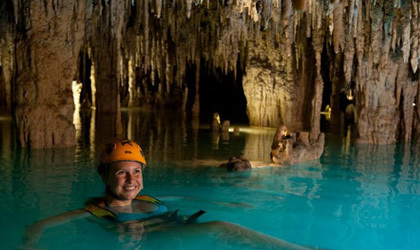 So when visiting the Mayan Riviera, remember to bring the water-proof camera and shoes, check-in at the underground reception area of Xplor to get your protective helmet and venture yourself into one of the most breathtaking and astonishing experiences the Yucatan Peninsula has to offer.